Origin stories are always interesting, whether they are about comic book heroes or casino games. Keno, however, has a more interesting origin story than most, partially because no one seems to agree on what it is. A thorough search of the internet turns up stories of emperors, railroad workers and Nevada gamblers. Below is a chronological abstract of the more interesting tales. Wars have always been expensive. In the 2nd century BC it is said Cheung Leung of the Han Dynasty was fresh out of cash for his latest prolonged conflict. Knowing his people were fed up with taxes, Cheung sought a more elegant solution: gambling! Potentially the first national lotto, Keno quickly gained favor with the masses and was named “White Pigeon” because of the birds used to fly results to rural locations. Keno is also reputed to have been used to finance the construction of the Great Wall of China. 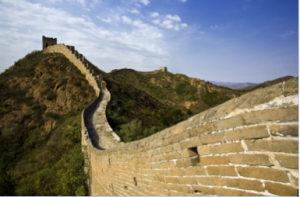 Built to shield the Chinese empire from outside threats, the Great Wall started construction in the 7th century BC and continued for 500 years. (That’s a lot of Keno cash!) One architectural survey found the Great Wall to be over 13,000 miles long. Many Chinese immigrated to America in the 1800s to work on the railroads. Upon reaching San Francisco, some introduced Keno to their American counterparts. The game gained popularity as a way for railroad workers to relax after a hard day. The Americans found the Chinese characters confusing, however, and replaced them with more conventional Arabic numbers. In an odd legal quirk, gambling in early 20th century America was legal, but lotteries were not. The Feds considered Keno a lottery, creating a big problem for game operators. To circumvent this, the Keno operators came up with a solution. They called the game “Racehorse Keno” and claimed it was a racing (thus gambling) game instead of a lottery. The numbers of the Keno card correlated to specific horses and the drawings were called races, a moniker that hangs on in some casinos to this day. Regardless of its origins, Keno remains an incredibly fun game we play to this day. And with a Weekend Keno Tournament every Saturday at 1 p.m., your favorite Suquamish Clearwater Casino can always be counted on for the most exciting, communal Keno experience! We look forward to seeing you in the lounge!